I am exhausted. It is just after 5pm as I write this but my body thinks it is 1am. Since I have to go to work in the morning, I need to push through as much as I can and stay up until at least 8 or 9. So, I thought I would take a break from tiny house updates to share a little about our first couple days in Durban KwaZulu-Natal South Africa. We left Atlanta sometime on the 11th. After that, all dates and times were a bit of a blur. We arrived in Durban about 8pm on Saturday, the 12th so we lost a whole day due to traveling. When we arrived, our friends Priscilla and Austin picked us up and the airport and took us back to where they live in Amanzimtoti which is further down the coast of the Indian Ocean. Unfortunately we weren't terribly tired yet due to the time difference so we hung out for a while getting to know everyone. Two other friends were there as well - Tammy from New Mexico and Ellen from New York State. We sat up for a while on the patio over looking the ocean talking about the organization and challenges we would face. We finally turned in for the night. We were most surprised to discover that the sun rises this time of year at about 4:45 in the morning. This was a bit of a shock to my system since I tend to wake up when the sun comes up on a regular day. But I forced myself to sleep in as late as I could. Tammy made breakfast burritos - because she has brought a suitcase full of Mexican food for Priscilla since no such thing exists in South Africa. We decided to take a walk on the beach. I have been to the Pacific Ocean in Oregon and the Atlantic Ocean from the state side and from Europe, but I never really thought I would be walking along the shores of the Indian ocean. Unfortunately, it was a little overcast that day but it was a gorgeous day for a nice walk. We did get to see crabs on the beach. We also had a chance to wade in the tide pools on the rocks and we found a starfish. Don't worry, we put him back where he came from just in case he had family there. After we got back from the beach, we went out to the local grocery store to pick up food to take to the kids currently living in a two bedroom house under the care of an incredible woman named Mildred. This is the reason we're there. If we can build a place for these kids and more down the road to be able to live comfortably, we have done our job. 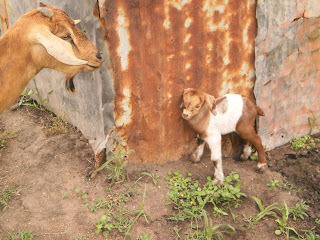 When we arrived at Mildred's we learned that two brand new baby goats were born that morning. I didn't have my camera, but I pulled this photo of Priscilla's face book page - I hope she doesn't mind. Then we played with the kids for a while. 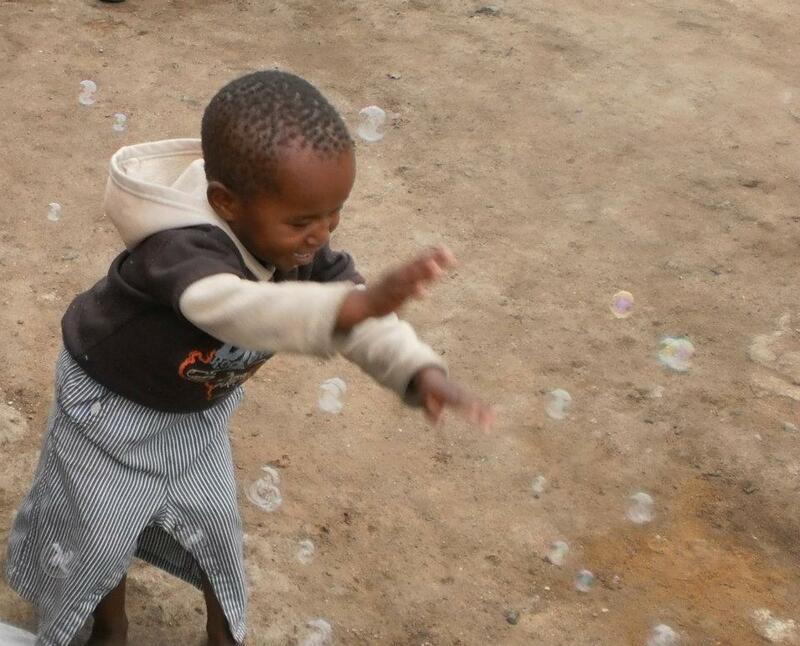 Tammy brought bubbles and the kids has a great time chasing and popping them. This is another of Priscilla's photos. This is a little girl named Busi who is going to be a force to be reckoned with one day. We also got to see the land a bit and determine the approximate acreage and maybe some ideas about how to place the house. There were some little things like remembering that building something south facing isn't really useful in the southern hemisphere - we just have to turn everything backwards in our heads. We eventually made is back to the flat and had dinner. Tammy made enchilada's. And Priscilla's daughter, Angel, showed us a video of South African comedian Trevor Noah. Okay, I am drained just typing out what happened in day one. I will have to come back to the rest of the trip later. Stay tuned for more updates soon.